Ron Sharpe and Barbra Russell first met in Les Miserables playing young romantic leads of Marius and Cosette. After being married on stage hundreds of times, they did it for real. They are still married to each other and to the great Broadway musicals that brought them together. 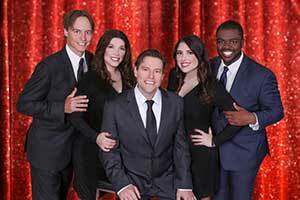 In Married to Broadway, Ron and Barbra, along with friends, share their love of Broadway musicals by performing the big show-stopping numbers that are audience favorites around the world. The show also features several famous holiday classics.